I thought the Rams actually had a good defense? 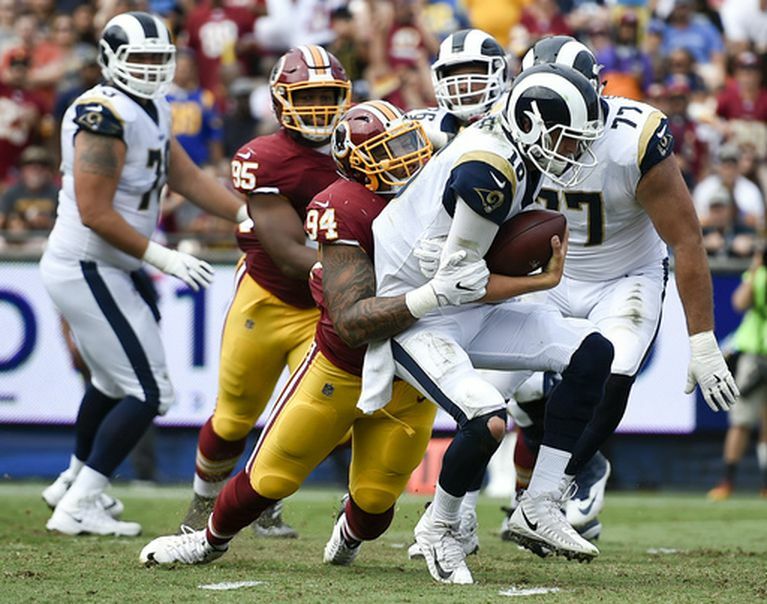 The Rams were handing out rushing yards like they had a Groupon for them against the Redskins. So much for the Rams getting Aaron Donald back and taking advantage of a soft early schedule. That was a very winnable game they failed to take advantage of. At least Todd Gurley looked as good as he was during his rookie year, and I guess we’re supposed to be excited that Jared Goff isn’t as crappy as we all thought he might be. This team is still lacking a lot of talent, and it’s going to really show in the coming weeks against better teams. They are also lacking some serious fan support too, with a reported 56,612 in attendance yesterday. It feels like 25,000 of those people showed up disguised as seats. Things were just as embarrassing in Carson, where the Chargers found a way to blow another game in dramatic fashion. This time it was against the Dolphins. You can take the Chargers out of San Diego, but you can’t take bad losses away from the Chargers. After the team spent all week talking trash about Jay Cutler and how useless he is, they found a way to lose to his team. For the 2nd straight game the Bolts lost on the leg of Younghoe Koo. He should change his name to Younghoe Boo because the fans should boo him when he steps on to the field. Oh and by “the fans” I mean the mere 25,000 that showed up to watch the team play. The combined attendance of the Rams and Chargers was 81,000 this weekend, which is less than the 84,000 that showed up on Saturday to watch USC play Texas. I can’t wait to see what the StubHub Center looks like when the Raiders come to town and the entire stadium is silver and black. Elsewhere around the NFL in Week 2, Tom Brady went full on Katrina against the Saints and their bad defense. The Patriots keep losing players to injuries but keep winning. I walked to the fridge and picked up more yards than ‘Zeke Elliott did in the Cowboys’ loss to the Broncos. Marshawn Lynch is the perfect Raider, and they dominated the Jets. The Seahawks won but they score about as often as Steve Urkel. The Packer defense was already in postseason form in their loss to the Falcons. Andy Reid is going to celebrate the Chiefs victory over his former team by giving his cholesterol a shot of KC BBQ. The Vikings should have just forfeited against the Steelers when they found out they had to start Case Keenum in place of the injured Sam Bradford. The Ravens beat the Browns, but so does everybody. The Colts found a better quarterback but couldn’t find a win against Arizona. Starting Blake Bortles at QB is like having your football team destroyed by a hurricane every week, which the Jags learned in their loss to the Tennessee. The Bears got destroyed by the Bucs, and are playing like Jay Cutler is still their quarterback. Greg Olsen’s foot is broken and so is Carolina’s offense, despite their win against the Bills. The last time the Bengals scored a touchdown, Obama was still President. To College Football where USC escaped with a win Saturday night against Texas, in a game that was nearly disasterous for their season. Perhaps the Trojan players were star struck by seeing Matthew McConaughey on the sidelines, or just thinking about him selling them a Lincoln. Just when you think USC has turned the corner, they come out flat against a team they should have blown off the field. To make matters worse, Stanford lost to San Diego State, meaning that the Trojans haven’t even beaten a ranked team yet, while struggling in two of their three wins. Clay Helton was out-coached by Tom Herman, and were it not for some late game heroics, Sam Darnold was outplayed by a true freshman quarterback for Texas. This is sure to hit them in the rankings, and has to make you skeptical. I like how ten years later, this game was hyped up for “revenge” for what happened in 2006. I’m pretty sure none of the current players on either side gives a damn about that, and are more focused on what party they are going to go to next Thursday night on fraternity row. As for the Bruins, they suffered an embarrassment of their own by losing to Memphis. I don’t care if the game was too early. UCLA should never lose to a team like Memphis. Do you really expect Josh Rosen to throw the ball 56 times, or any quarterback, and not throw two interceptions? Rosen’s ego can be irritating, but you can’t blame these losses on him when Jim Mora is asking him to play hero ball. UCLA has no system and they have no running game. It wouldn’t be surprising at all to see the Bruins get beaten like they stole something next weekend against Stanford. As long as Mora is coaching this team, Bruin fans should buy a Vegas timeshare for their annual trip to the Las Vegas Bowl. Elsewhere around College Football, Notre Dame did the UNTHINKABLE and knocked off an unranked Boston College team. I’m waiting for the day Brandon Wimbush gets his head knocked off as Brian Kelly gets another one of his quarterbacks killed by letting him run around like he’s Forest Gump. That’s what happens when the rest of your offense is inept. The Clemson defense is the kryptonite to Lamar Jackson. The SEC has announced they are demoting Tennessee to Pee Wee Football and will no longer be affiliated with the program. Well at least they should announce that after Tennessee lost to Florida on a last second Hail Mary. 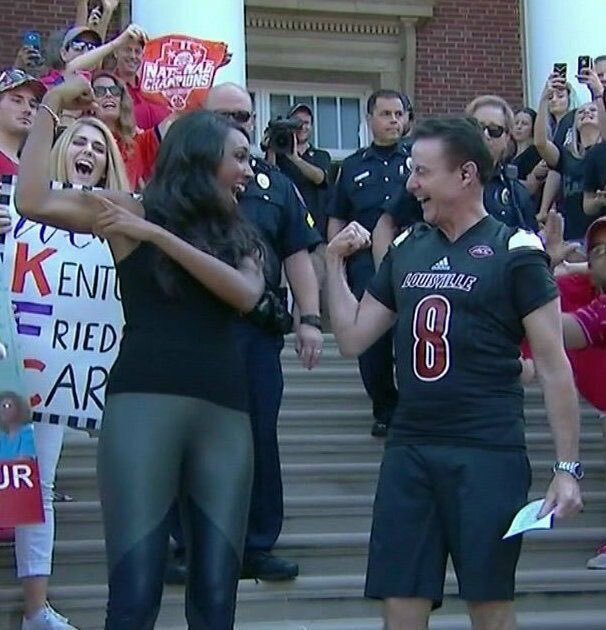 Rick Pitino made an appearance on ESPN’s College Gameday, but I didn’t realize that he buys his clothes at Baby Gap…. The Dodgers are really making a habit of this whole winning thing. It was one thing to merely end that 11-game losing skid, but now they are hot again. Cody Bellinger claimed that what helped the team get through such a rough stretch was having veterans who had been there before. I didn’t realize that the Dodgers have players on their roster that have been on the team since 1958, because that’s the last time they had a streak that bad. The Dodgers’ potential for playoff failure still scares me to death. Somehow they found a center fielder that is worse than Joc Pederson. Not only should Curtis Granderson be chained to the bench, but so should Yasmani Grandal. Austin Barnes is statistically the most valuable hitter against right-handed pitching in the National League this year, so I have no idea why he isn’t in the lineup everyday. Only two more weeks before the postseason, and the Dodgers have to worry about their pitchers being done after five innings, and their hitters being done after September. The Angels sure are determined to make this AL Wild Card race interesting. It sure would help their chances though if they didn’t keep losing pitchers to elbow tears. The latest is JC Ramirez, who is done for the year, and possible next year too. It’s almost like the team’s training staff is always finding new ways to get their pitchers injured. Then there’s Luis Valbuena, who is perfecting his bat flip, even during those moments where he’s barely hitting the ball out of the infield. Valbuena can’t even hit .200, meaning that never has an athlete that is so bad acted so cocky. Valbuena’s antics actually angered Astros pitcher Mike Fiers so much, after giving up a home run to the Angels’ infielder, he threw at his head. That got Fiers suspended for five games. Fiers said he felt “disrespected”. If you give up a home run to a guy who is hitting .200, you deserve to be disrespected and suspended. In case you haven’t heard, the Lakers are retiring Kobe’s jersey on December 18th, when they host the Warriors. They will also be retiring both his #8 and #24 jersey’s. I think the #24 Kobe was much better than the #8 Kobe, and the Mamba reached the pinnacle of his career wearing #24. That one should really be the only one to be retired, however, there’s probably no player in their right mind who would want to wear #8, so the Lakers might as well retire both jerseys. By the way, the cheapest ticket to get in that game right now is $600. The NHL preseason is underway, and it couldn’t have gotten off to a cloudier start for the Kings. Defenseman Drew Doughty told The Sporting News that if the team didn’t start contending for Stanley Cups again, he would consider signing elsewhere when his contract expires in two seasons. When an LA Times reporter questioned him about this, he said he would love to finish his career as a King. Drew, if you back peddle any faster, you will start moon walking like Michael Jackson. The Kings are a lot closer to rebuilding than contending, and Doughty could easily leave the team in two years. On the bright side though, the Kings Twitter account is run far better than that of the Ducks. 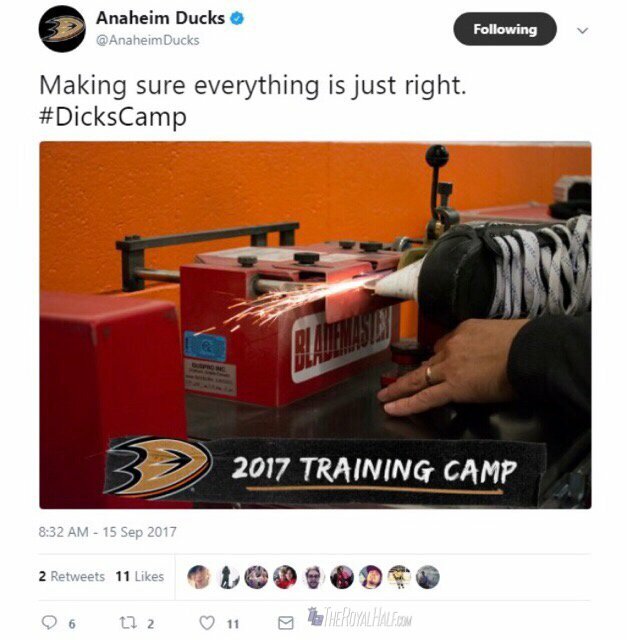 Here’s a look at their early season social media fail…. Finally, has ESPN’s Jamele Hill been living under a rock for the last year? She just witnessed complete carnage at her company, as a number of her colleagues were laid off due to declining ratings and more cord cutting. We can attribute some of that to the fact that ESPN’s content has become more and more political, which has displeased viewers. So what does Jamele do? She decides to go on some Twitter rant, ripping Donald Trump for being a racist, and called him a white supremacist. Regardless of what you think of Donald Trump, if Jamele wants her political voice to be heard, she should just go join CNN with the 12 other people sitting at a desk screaming their biased opinions at each other. I also like how hypocritical ESPN is after suspending Linda Cohen last spring for saying the network was getting too political, yet they did nothing to Hill for her unnecessary rant. It’s also apparent to me that Colin Kaepernick has no desire to play in the NFL, because he came out and supported her rant on Twitter. I guess the man just couldn’t get enough controversy in his life. This entry was posted in Morning Coffee on September 18, 2017 by omzzzzz.